I’m not going to pretend to know Cole Whitt. I mean, how can you really get to know someone after two interviews and a weekend in Daytona? But I think I got a good read on the guy, and if I could use one phrase to describe him, I’d say that he’s approachably focused. He’s equal parts humble and hungry. Whitt doesn’t carry himself like a superstar race car diva. He’s got work to put in and he welcomes that work. That doesn’t mean he won’t flash a big, genuine smile when meeting a fan or take time to answer silly questions from bloggers like me. When you meet Cole, you sense quickly that he’s a private guy. Not a limelight seeker by any stretch. He prefers CrossFit and the outdoors to press rooms and podiums. Behind this surface of shyness, though, there’s a big heart and a ferocious sense of purpose. You don’t earn a nickname like the Ginger Lion by being a pansy. It should be noted, that racing ain’t easy, man. Especially if you want to compete in the NASCAR Sprint Cup Series, the nation’s highest stock car division. It’s a taxing endeavor all around. You need financial backing from your teams and sponsors, and soul support from your family and crew. On a weekly basis, you have to overcome the physical rigors of driving hundreds of miles with inches separating you from disaster. Then there’s mental prep required to get your head right before, during and after competition. This is some seriously stressful stuff, but the stakes are high, my friend. This year’s Daytona 500 had a purse of over $18 million. That’s a lot of coin for 43 drivers to chase in one day. Imagine you’re a pocket-sized, 23-year-old professional driver entering your second full season in the NASCAR Sprint Cup Series. You’re a full-blown ginger and your height and weight aren’t listed on your NASCAR profile. The biggest expectations you have come from within. You’re confident, because you’ve been racing for more than half your life. There’s doubters all around, but not in your inner circle. Your first season had its set of challenges. Your car got jacked up during practice at the Daytona 500 and there was no backup car available. Your team rallied to make repairs, just to get you into qualifying. With no guarantee that you’d even compete, you make up eight spots on the final five laps of your Budweiser Duel to secure entry in the 2014 Daytona 500. You showed a ton of promise in your first full Sprint Cup season. You finished better than you qualified in three of every four races you entered. You created some rookie of the year buzz and things looked promising. With little warning, your racing team shuts down operations in April. You switch teams to close the year out and it’s unclear who’ll have a spot for you next season. Shoulder surgery that cuts into your offseason prep, but at least you secured a spot a new team. With your second season set to begin, you find yourself back in Daytona needing to fight your way in again. This is where the Ginger Lion stood, right before the Budweiser Duels. Running in the #35 car for Front Row Motorsports, Cole Whitt was on the outside looking in and needed a good showing to earn a spot in the Great American Race. It’s #DefyTheDoubt time for damn sure. Whitt’s strong finish in the Budweiser Duels meant that he punched his ticket into Daytona to start the 2015 season. Last week we had a chat with NASCAR Sprint Cup Series Rookie of the Year candidate Cole Whitt as he was preparing for the Daytona 500. Whitt is just 22 years old, but the guy’s been racing for years. HE started racing when he saw one of his cousins with a go kart. He moved from go karts to midget cars to sprint cars and trucks and made his NASCAR debut in 2010. He has 11 top ten finished in the World Truck Series, 18 top ten finishes in the Nationwide Series and now he’s driving the No. 26 Toyota Camry car for Swan Racing in the Sprint Cup Series. Men’s Speed Stick GEAR will serve as Whitt’s new NASCAR sponsor, and the brand will be featuring a documentary series on Whitt’s journey to the Daytona 500 starting in March on the Speed Stick Power YouTube Channel. 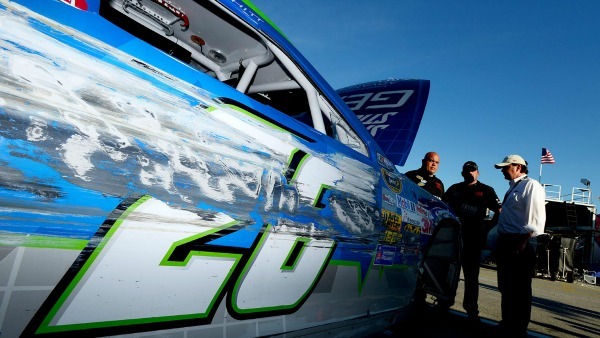 After overcoming a bit of car damage adversity to make the race, Whitt finished 28th overall at Daytona. CS: So to start off, I was checkin’ out your website and it looks like you’re into hunting because you got a picture of you front and center with a bow and arrow. Can you explain to me what bow season’s all about? CW: You know the bow hunting is just something that I’ve enjoy. It’s not so much going out and having to harvest something, but just the fact that bow season is kinda the opposite of racing. It’s nice to be able to slow down and relax. Bow hunting is all about getting close. There’s a whole other challenge to it. I enjoy the tricking part of it. Technically, I just spear hunt mostly, so tricking deer for the most part. CS: Racing is kind of in your family – well, not kind of, it certainly is. When did you first realize you were going to be a professional race car driver? CW: I don’t know. It’s in me right now, you know it can be taken away at any moment I know that that’s why I don’t take it for granted. You know I’m very blessed to be able to do this and to do it at the level I am right now and I’ve just been doing it. Even when I was racing go karting, we just never took it for granted and we always knew at any moment things could be taken away. And you know, there’s been many times where it has and things have always worked out to come back around for something else. Just staying focused with having a good family behind me and raising me the right way made a big difference and I think just being able to be this far is pretty exciting, regardless of what happens from here. CS: Can you tell me a bit about your participation in Red Bull’s Driver Development Search? CW: Yeah. That whole thing kind of came together last minute. They were doing that Red Bull driver search looking for actually an F1 driver and I wasn’t going to do it. I was actually just kind of racing go karts at the time with my family and just having fun. We were winning a lot of races and championships, but we were just having fun and clearly didn’t think anything of it. And the next thing you know someone’s like, hey you really need to go do this thing they’re going to let you go straight to a qualifying round. So alright, we go out there and have fun with it and after the whole thing was said and done, long story short, they wanted to meet and it progressed into a sponsorship. They’re actually probably the only reason why I’ve made it this far in the sport. It was a great partnership and it was great while it lasted. Just a great company. They did a lot for me. CS: Their racing program has since shut down. How did that go down, do you know? CW: Yeah, I don’t know the specifics on it but I think whatever they needed to do was for their best interests and I support every decision that they’ve ever made just because of how much they’ve done for me. You know, they were great people. They were great to me and took care of me well. I don’t know the logistics behind why or what they did, but I’m sure they had good reasoning. CS: You’re a rookie of the year candidate this year, so you’re certainly holding your own and then some. Is there specific preparation that you go through or any kind of rituals or superstitious stuff that you do before each race? CW: Nah, I’m not superstitious. I kinda feel like it’s going to be whatever it’s supposed to be. I’m pretty confident that everything will take care of itself. For the most part though, like you said, being in that rookie class, this is one of the biggest rookie classes they’ve had in the cup series and one of the most talented. To be part of that’s a pretty cool honor and to be able to say that we had a good shot of winning it is pretty cool also. It says a lot about me and what we stand for as a team and what we’re getting ready to build. I’m pretty excited to see how that turns out. CS: What’s your favorite track ever? Go karts, sprint cars, stock cars, any of the above. CW: I’d say my favorite track so far is either the Old Phoenix before they repaved it and then probably Kokomo speedway the dirt sprint car track in Indiana. CS: Nice. Now I also saw that you’re pretty up on social media. How do you leverage social media to connect with the fans of the sport? CW: Yeah, social media is pretty neat and I’ve actually gotten better with it over time because I really didn’t use it to connect with fans at first, but now I’ve been using it more to connect with fans. It’s been a lot more fun once you do that and you realize how much they enjoy it and I like that. You know there’s no reason why we can’t, it takes two seconds. You’re on your phone anyways probably looking at it or reading it and when someone posts something to you and you reply or talk to them or give them something they want to know or give them an inside look at something, that’s what gets people excited. And without those fans our sport would be nothing. Just having the gratitude and the mindset that these guys are paying for the seats and coming to watch us at the race track is what drives our sport in the first place. CS: What would you say is your most anticipated race of the season? CW: I’d say right now Daytona 500 is probably my biggest anticipation. There’s a lot riding on this and there’s a lot that could happen here. But at the same time if things don’t work out for the best there, I know I can pull through and look forward to Phoenix and other races down the road. I look forward to the whole season, but Daytona 500 right here is something I’m really looking forward to. CS: I got one more question about your leisurely activities. How good is your golf game? CW: (laughs) Um, not too well. I actually started playing more in the past little while (laughs), but not too good. I’m more into the cross fit training and a lot of fitness is what I probably do the most. 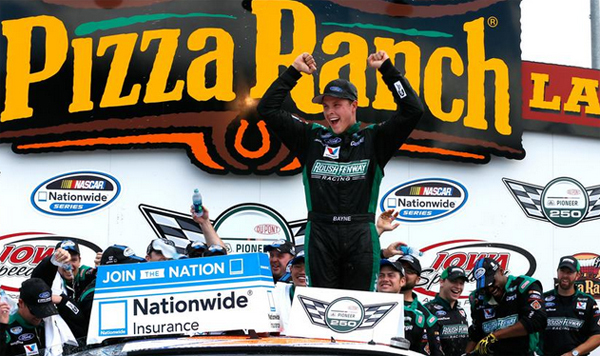 Trevor Bayne had a really outstanding week this past week. He got married and then come Saturday he headed straight to Iowa where he landed in Victory Lane. This weekend he will be driving at the Michigan International Speedway. 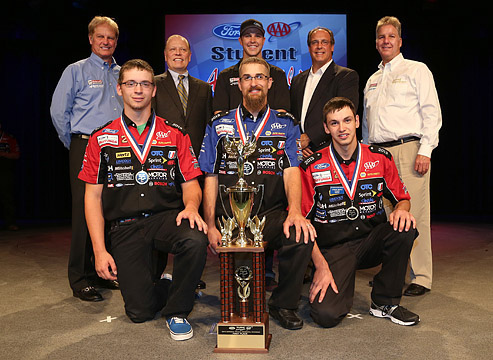 While he is in Michigan he took part in the 2013 Ford/AAA Student Auto Skills Competition National Finals. Students compete to win scholarships and prizes. 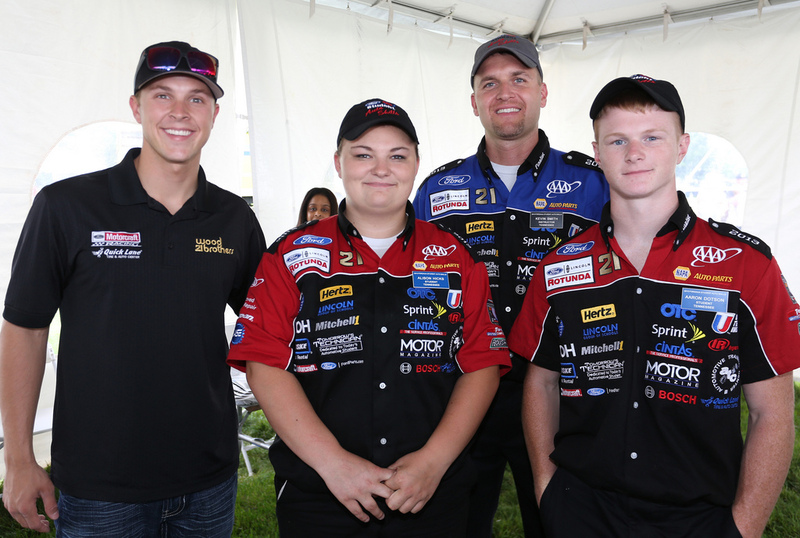 Plus the winning team will also have a weeklong job shadowing Bayne and Wood Brothers Racing leading up to and during the Coke Zero 400 this July in Daytona. I was able to talk with Trevor on the phone about racing, his wedding, and the 2013 Ford/AAA Student Auto Skills Competition. Plus I also got to ask him what his car of choice is when he is not on the track. Art Eddy: I have to say congratulations twice to you. 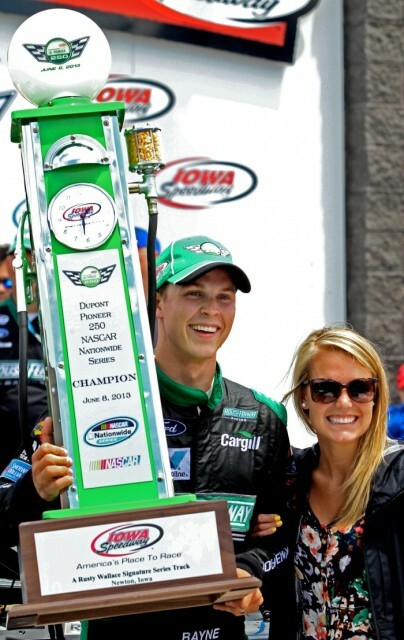 One for getting married this past week and then winning the Nationwide at Iowa on Saturday. Tell me how you plan to top last weekend with this weekend? 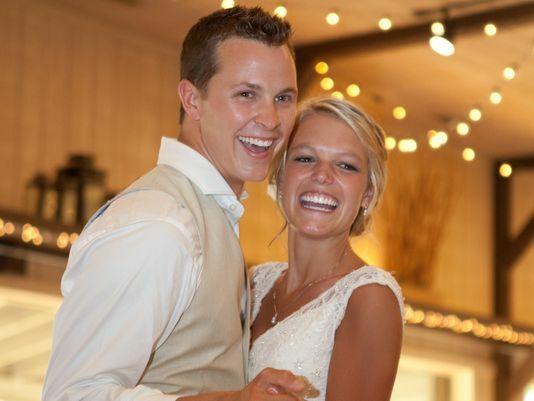 Trevor Bayne: (Laughs) Well that was a big weekend for us. It was a big week getting married and it was a huge deal and bigger than anything I could ever do on the racetrack. I topped it off by winning at Iowa last weekend. Pretty incredible weekend for us. Ashton told me all along that as soon as we got married I had to win the next race. So I guess I should have married her a long time ago. That’s when we knew we lived up to the pressure she put on me. So we will have to keep that going. AE: How hard was it to transition from wedding day to racing day? TB: It was okay. I have been doing this since I was five years old. This is pretty much all I have ever known. Ashton is obviously a trooper because we got married on Tuesday. We ended up going to Iowa for our honeymoon. If she can handle that she is a big support factor. For me as far as flipping the switch it seems like we do that every week. We have crazy stuff going on just like I am up in Michigan today. Flying back to Charlotte. Then flying back to Michigan on Thursday morning to get ready for the race. It is always a busy lifestyle, but once you get to the racetrack you can turn it all off, hop in the car and try and get the most out of it. AE: People joked about having your honeymoon at the Iowa Speedway. I take it that the honeymoon will happen after this season is over. TB: Yea I am hoping so. I am hoping that this offseason we will get together somewhere whether it’s somewhere warm like a beach. Get to go on vacation for a little bit and call it a honeymoon. So that will be a good excuse for it. AE: Your first win was in 2011 with coming in first place at the Daytona 500. What a place to get your first win right? TB: Winning the Daytona 500 in 2011 was beyond anything I could ever imagine. Being my first time at that race driving for the Wood Brothers. Seeing them back at Victory Lane was worth it. I have been waiting on that moment ever since I started racing. I wanted to make it to the Sprint Cup level in NASCAR and be a contender to win. I never really pictured it to happen that soon in the first attempt there. I just have great people around me that gave me that opportunity and a great racecar that day. Everything worked out perfect. It was pretty much a miracle. There was no way I should have won that race. I was praying all day and saying God I want to experience you and see your power. I didn’t know that that meant a win, but I guess that is how it happened that day. AE: You are now in Michigan for the Ford/AAA Student Auto Skills competition. Tell me a bit about this great program. TB: Yea it is an awesome program. I have been a part of it for the last three years. For that last two years I have come up to Michigan for the grand finale. Ford and AAA have put it on for the last 64 years. Ford actually has been with it for 19 years, but 64 years is how long the competition has been going on. It starts out with 13,000 students. They narrow it down to 100 students. Two from each state along with an instructor from that state. They come here to Michigan for the finals. They had Ford Explorers here today. They were all bugged. I think that they had 14 bugs on the car. They didn’t tell what the students what was wrong. Then the students have to go in and try and figure out what is wrong, why the thing won’t run. Why the windshield wipers don’t work, or the blinkers or whatever. Try to fix the car and put it through the line for inspection. The quickest team with the least flaws obviously, there was a perfect car today and pass a written test. The people that win that are rewarded with scholarships. They get to come to Charlotte, North Carolina for a week and hang out with our race team and then go to the Daytona Speedway with us in July. AE: How psyched are you to be part of this program? TB: Just getting people interested in the automotive industry whether it is working at a Ford dealership or being part of a NASCAR team. It is awesome to see these kids who are 17, 18 years old with as much knowledge as they have can perform under pressure like they did today. AE: Where is your favorite track to compete at? TB: I would say one of my favorite tracks is the Atlanta Motorsport Speedway or Bristol. Bristol being the home track. Atlanta just being a cool place, kind of worn out and old school and I enjoy racing there. So I would say those are my favorites. AE: What do you do in the off-season when you are not racing? TB: The off-season is normally kind of time for me to reload. We go 10 months straight without any off weekend from pretty much Valentine’s Day to November. It is a lot of work and a lot of time. It is a full time job. So my wife and I would go on some trips with some friends. I try to gain some perspective because you can caught up in racing and think you have a bad day since you came in fifth. Whereas some people in the world don’t have anything. AE: Out the cars you own which is your favorite to drive? TB: My Ford Raptor. That thing is fun to drive. I got it in 2011 after winning the 500. I never want to give it back. To listen to the entire interview click here! Matt Kenseth won a wild Daytona 500 a few weeks back. Due to the rain delay and the extra-late conclusion of the race, Kenseth wasn’t able to attend his Champion’s Breakfast until this week. We talked to Kenseth on Wednesday about his Daytona experience, social media, the new tandem racing rule changes and the upcoming race in Texas this weekend on FOX. CS: So how does it feel to finally get Daytona 500 Champion’s Breakfast out of the way? MK: Well there’s there problem, I showed up and there’s no food. MK: I guess it’s not breakfast. That was the bad part. We got jipped out of the food (laughs). But it’s cool to come out here and see the car sitting there in the Daytona 500 Experience with all the confetti on it just like it was sitting in Victory Lane. It was really neat. I mean it’s different coming now a couple months later and celebrating it, but it’s always neat to come back and see the car, see the fans, and kind of relive the experience of the Daytona 500. CS: That was such a wild race, man. I was following along on TV along with a bunch of other people. How did you stay in the right mindset with that extra long delay? MK: Yeah it was different. Waiting till Monday night was one thing, but that delay in the middle of the race was really … it was really kind of a tough one. So it was after our last pit stop and I was worried about the track not getting fixed. And, you know, if we went back to green we were going to be the leader, the first off pit row, and the guys in front of us were going to have to pit. So it was just a lot of anxiety and you know, anticipating getting the race started and wondering what’s going to happen. CS: And what did you think about Brad Keselowski’s Twitter antics during the red flag? MK: Well he just seemed to be popular with the fans and the media and the TV and all that. It was very popular with the fans and the broadcasters and the TV and doing all that stuff. For me, it didn’t really matter to me. I was more thinking about the race than I was about Tweeting. CS: Do you use social media at all to connect with fans? I mean, when you’re not racing? MK: I do. I got on Twitter last August or something like that, so I was one of the later ones. But I do get on there at least a couple times a week, usually. You know, send some notes or pictures about what I’m doing or whatever and try to get on there and communicate with the fans on Fridays or Saturdays when I get a little down time at the track. I’m not on there every day and checking it every day, several times a day – I think like a lot of people do. I enjoy finding another way to connect with the fans. CS: Gotcha. And what do you think about the new tandem racing rule changes? MK: Oh I like the new rules that broke up the pack a little bit. You get back to kind of pack racing and kind of racing, you know, one against 42 and trying to make moves and not so much worrying about another car. CS: You think most drivers have adjusted to the rule changes already? MK: Yeah. Yeah I do. I think that’s kind of the way it was forever and I think everybody’s adjusting pretty well. That’s a little different. You can still try to get locked up for a couple laps, but it certainly has changed the race ethic for the better. CS: Now I’m sure you get asked this all the time but what was your initial reaction a few years back to the Matt Kenseth rule – the whole point change that was made after your first championship? MK: Oh, I think the change to the Chase was great. I think, if you look at last year for instance, I don’t think the battle or race could have been any more exciting. I mean at the ended up being the same amount of points and it went to the guy with the most wins, which I think is what they want. You had some people qualify for the chase, you know, with wins during the season but couldn’t make the top ten for whatever reasons – they had a bad start, but won some races made the Chase and were contenders down the stretch. I think it’s really added a new exciting element to the sport. CS: Excellent. So last question, what’s the race you’re most looking forward to the rest of the way? MK: Well, there’s a lot of races left, but right now I’m really looking forward to going to Texas. That’s always been one of my favorite tracks and we’ve had some pretty good success there in the past so I’m looking forward to getting out there and getting on the track tomorrow. Matt is currently in fourth place in the Sprint Cup Series. Tune in to FOX this Saturday at 7pm EST to see Matt try for his third victory at the Texas Motor Speedway. So last night was a great night for our friends at Valvoline and Roush Fenway Racing. We had a rooting interest in cheering on Jeff Burton (due to our participation in the Daytona 500 Blogger Challenge and the fact that he’s a really cool guy), but we have a history with the guys from Roush Fenway Racing and Valvoline as well, so it was awesome to see them enjoy success at Daytona. The Roush team includes Carl Edwards, Greg Biffle, Matt Kenseth, Trevor Bayne and Ricky Stenhouse, Jr. Kenseth beat out teammate Greg Biffle to win the Daytona 500, much like he did during the Gatorade Duel Daytona 500 qualifying race in Thursday’s second duel session at Daytona International Speedway. This put Kenseth in the #4 starting position for the Daytona 500, just behind Carl Edwards (who earned the pole) and Greg Biffle who earned the #2 starting spot. Matt Kenseth finished fourth in the 2011 NASCAR Sprint Cup Series, and his teammate Carl Edwards lost to Tony Stewart in a tie-breaker. 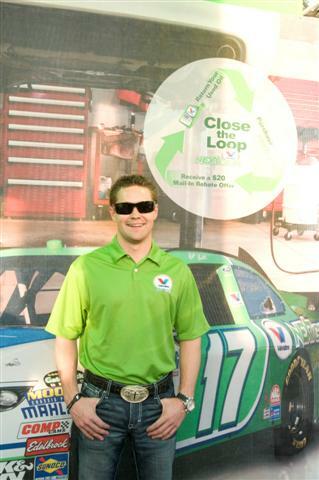 Ricky Stenhouse Jr, was the 2011 Nationwide Series Champion. Roush Fenway Racing had three drivers finish in the top 10 in the Daytona 500 yesterday. Not bad at all. Fans get a chance to dress like the pros at the Valvoline NextGen Pit Stop during the Daytona 500. 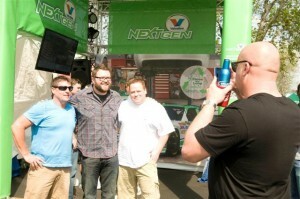 Rutledge Wood from Top Gear (USA) shows fans how they can Close the Loop and get a $20 gift card from Valvoline by returning their used oil to be recycled into NextGen motor oil. Fans enjoy complimentary gear and learn how they can Close the Loop at the Valvoline NextGen Pit Stop during the Daytona 500. Ricky Stenhouse Jr., visits the Valvoline NextGen Pit Stop to share his excitement about his team’s decision to run Valvoline NextGen technology in all of their Sprint Cup and Nationwide cars this season. 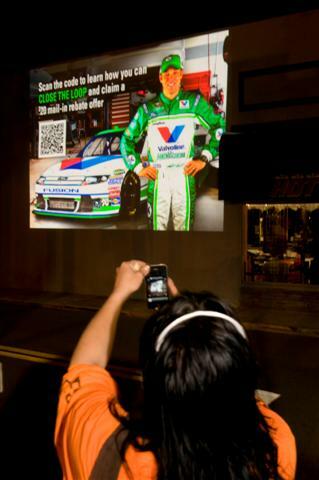 Race fans take in the pop-up Valvoline NextGen projection billboards all around town during the Daytona 500. Congrats again to our friends at Valvoline and kudos to Roush Fenway Racing for earning their 300th NASCAR victory! Last night’s Daytona 500 likely did more to further interest in the sport of NASCAR than any race that came before. This race had it all – early controversy, chippy driving, a pyrotechnic explosion of jet fuel, a two hour delay that featured miraculous track repair work, an explosion of social media interest and if all that wasn’t enough, a little bit of free, overtime NASCAR. What a spectacle. What a way to recruit new fans to the sport. Pushing the race to a prime time platform was a stroke of genius. During the red flag, the anticipation that built up for those last 40 laps was palatable. This isn’t to say that NASCAR didn’t have a massive following before last night. Of course it did. But on a night when there was no basketball, no football, no baseball, no other major sport competing for eyeballs, the wild, unpredictable race in Daytona won over new NASCAR fans in droves. Fox’s rain-delayed broadcast of the Daytona 500 brought in 14.2 million viewers. The network finished ahead on Monday night, drawing in viewers away from regular programming on NBC, CBS, and ABC. After Juan Pablo Montoya crashed into jet dryer containing 200 gallons of jet fuel, the race was delayed for a full two hours as NASCAR cleanup crews used Tide detergent and a bunch of other stuff to fix the damaged track. During this red flag pause, drivers started getting out of their cars and hanging out. One driver, Brad Keselowski, started tweeting like crazy. He actually took a photo of the Montoya crash from his car while driving on the track. He tweeted the photo, became a topic of conversation, and used the red flag delay to generate over 100,000 new followers on Twitter. Keselowski ended up crashing out after the restart, but he sure did a lot to promote himself and the sport while other NASCAR drivers were standing around waiting to get back into the action. Jeff Burton, our driver in the Daytona 500 Blogger Challenge ran well the whole night. He led for 24 laps and finished in fifth place. We’ll have some JB autographed merchandise to give away soon, so make sure you keep an eye on that for your chance to win. Matt Kenseth beat out Dale Earnhardt Jr and fellow Roush Fenway teammate Greg Biffle to win his second Daytona 500. The race ended with a green and white checked flag and two extra overtime laps. It was a fitting end to a crazy night of racing. Congrats to Kenseth, Roush Fenway, Valvoline and The Smoking Jacket, who had Kenseth in the Daytona 500 Blogger Challenge. Make sure to tune in to Fox next week as the NASCAR season rolls on at the Phoenix International Raceway. I went to my first NASCAR race last year and I totally got into the sport. I mean these guys are in pressure cooker situations traveling at speeds close to 200 MPH for hours at a time. The amount of preparation that goes into each race is crazy. And the communication that takes place on race day between drivers, crew chiefs and pit crews is something that I never really understood. It’s just fun to watch and even more impressive to see in person. The NASCAR season kicks off this Sunday, Feb. 26 at 1pm with the Daytona 500 on FOX and we’re happy to be partnering up with NASCAR to celebrate the launch of the new season. MANjr is participating in the Daytona 500 Blogger Challenge this year. Basically, a bunch of blogs are getting assigned top drivers who will compete in the Daytona 500 this weekend. The driver with the best finish will deliver an all expense paid trip to the Sprint All Star Race in Charlotte, N.C. on May 19 for the participating blog and a lucky reader! 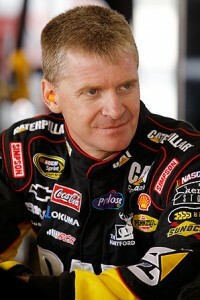 The drivers for the Daytona 500 Blogger Challenge were chosen at random and we got the Mayor, aka JB, aka Jeff Burton! JB’s appeared in 619 races during a NASCAR Sprint Cup Series career that has spanned almost 20 years. The 44 year old driver has collected $77 million over his NASCAR career. CS: So as a NASCAR driver how do you turn off that killer racing instinct when you’re just driving around town, like going to the grocery store or taking your family out to dinner? JB: (laughs) You know, driving a racecar is no different from driving a street car. The competition just isn’t there. The point of driving a racecar isn’t just about going fast. It’s about competition, and you don’t necessarily have somebody pushing you on the highway. Every now and again you do, you just have to ignore them. CS: But do you feel a constant need to pass people on the freeway? JB: I just stay the hell away from them. I’ve learned that most people don’t know how to drive. JB: I’m much happier when I stay away from them. CS: I read that you were pissed off about last year’s performance. It was your worst since ’95. How is that motivating you leading into this season? JB: Well obviously you put high standards for yourself and your team and when you don’t meet those standards, it’s very disappointing. And I think that in some cases people lay down a little bit. But I’ve always done better after real bad years and I think that it does, it does make you mad. It puts you in a position where you want to prove yourself not necessarily to other people but to yourself. And at the end of the day, you know motivation comes more from within than it does from outside. So you want to prove to yourself that you can do it. You want to have the best for yourself and your team. Those things are high motivators and I think that sometimes difficult years force change. In this case, we had a really bad year last year, but that put us in a position to activate some changes. It’s going to be better for us so I view it as kind of a stepping stone. Yeah, we had to go backwards to go forward, but I think that’s what we’ve done. CS: Well you did finish strong last season. You had four top 10 finishes in the final five races. How does that carry over year to year? JB: Well you know it’s always nice to finish strong because you feel like you’ve built on something and you had something to work off of. Last year we always put ourselves in great position to win races, and we did start having better finishes. But we still weren’t necessarily the best enough to win so we did change some stuff as the year went on and we did do a lot better, but we never were as good as we needed to be. So it was good to finish strong but it wasn’t strong enough to say “okay now we’ve got it figured out,” it was strong enough to say “okay we learned how not to do things.” But I feel like we got a grasp of what we needed to do to go out and be successful on a consistent basis. So you know it’s good, but it didn’t change the way it was. CS: Now you mentioned the changes from last season. One big change is your new crew chief. Are you excited to work with Drew Blickensderfer again? JB: Yeah, I’m really excited about that. I think that that’s just a big bonus for us. He’s got a tremendous amount of talent. He’s got a lot of drive, a lot of heart. He’s good with our people, very well respected. You know it was time for some new energy around here, time to bring in a new thought process. You know I worked with him before, but it was a long time ago. The timing was right, and we’re damn lucky to get him. CS: So what are the qualities that every good crew chief must possess? JB: Well it’s different for every team. You know there is no template that says “every crew chief is this, every crew chief is that,” you know. It varies from team to team, organization to organization. For us, I believe the crew chief is someone that can use all the tools around him, use the assets that the company has, add to those assets, be part of a distributing group that makes the overall company better, which obviously makes your individual team better. You can’t have the personality that it’s all about me, it’s all about me. It’s got to be about the whole company doing well. Honestly, we want 31 to be the best at RCR, but how we’re going about doing that is all working really really well together and then just doing a better job with the same assets. And if you don’t have that understanding and appreciation in today’s world I don’t think you can be successful. You’ve got to find a way to work with other teammates, motivate people, organize, delegate. It’s not a game anymore with the crew chief making all the decisions by himself. It’s truly a lot of people making decisions. It’s not just the crew chief.